This is the roof we toured at the conference! It is “semi intense”, planted in trays and suffering a bit from the extreme conditions in Denver, cold, heat, wind and sun. Also has suffered from lack of maintenance. But it has been successful both to absorb water runoff and to insulate the building reducing heating and cooling costs. I registered for this conference and then got to volunteer at the Green Roof seminar that I had signed up for on Thursday. Unfortunately I was too sick with a bad cold/sinus infection to return for the Friday sessions but the Green Roof seminar was really interesting. The presenters concentrated on green roofs in the desert southwest and high desert areas like Colorado. They had a slide show of green roofs, some of which have lasted over 100 years in Europe, and many of their own design. The presenters were Andy Creath, Green Roofs of Colorado and Mark Fusco, LEED AP, Bison Innovative Products. They recommended the American Society of Landscape Architect’s green roof website. 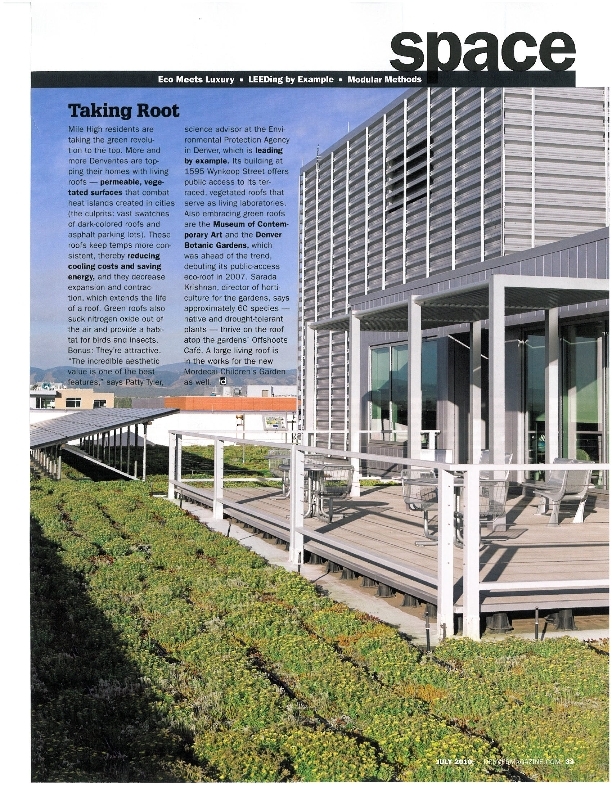 ASLA has a green roof on their headquarters in Washington D.C. There is a link from that site to a USA Today interactive site that shows the several layers used on a green roof. The presenters recommended at least three of those layers, the waterproof membrane, the drainage layer and the filter fabric to keep the soil fine particles out of the drainage. They also recommended a growing medium instead of actual “dirt” consisting of organic matter and expanded slate. They prefer a “semi-intense” design, which calls for 3-4″ of medium, usually used in trays. An “intense” system would have 12 or more inches of medium and can support deeper rooted plants like herbs and vegetables. Here are some recommended plants for a western green roof mentioned by the presenters: sedum album, sedum spurium, cactus, chrysanthemum variety, Mexican feather grass, yucca, seiboldiana (hosta sieboldiana, montanum not so good), penstemon, sulfur buckwheat, ice plants (need water), south african daisy, desert annuals, phacelia, prickly pear (great!) veronica, and ornamental onions. Biodiversity is best. Of course having a roof that can support a relatively heavy green roof is the first step. They said to expect about 25-30 pounds per square foot of weight. Roof are mostly engineered for at least 40 but with snow loads in Colorado, I’m not sure if our existing roof would be strong enough even for a tray system. I sent information to the presenters about the local company that makes a green roof containment system in Golden, Colorado, Invisible Solutions. I would like to use the products from this company in some way, either for a green deck or green roof system. Bison makes some pretty cool roof deck products locally too. Thanks to the presenters and USGBC Denver for a very interesting seminar. This entry was posted in Design Style, Green Building Interests, Local Products. Bookmark the permalink.